Posted by rik94566 in aquaponic automation, aquaponics, arduino, CAT 5 Cable, DIY aquaponics, DS18B20, Home Depot, indoor aquaponics, indoor gardens, indoor growing, Instructables, Lowes, Rj45 connector, sensor, Stainless Steel Temp Probe, Standards, Suppliers, Temperature Probe. Tonight I pulled all the posts from my work on the DS18B20 assembly and put it into an Instructable for anyone interested. I will see how how many views it will generate. Posted by rik94566 in aquaponic automation, aquaponics, arduino, CAT 5 Cable, DIY aquaponics, DS18B20, Hacks, Home Depot, indoor aquaponics, Lowes, Rj45 connector, sensor, Standards, Suppliers, Temperature Probe. Now that I have a DS18B20 temp probe connected to CAT 5 cable with RJ45 jack the unit is compete. But I don’t know if all the connections are working. So it is time to test the completed assembly. The only way to accomplish this task is to construct a RJ45 female plug with a CAT 5 cable end. I purchased my RJ45 female connector at Home Depot as I like this brand of connector. It is easy to use and I get consistent results. Lowes sells a different type connector, but it will work just the same. I will use the 3 wire standard configuration with the CAT 5 cable (ORANGE-BLUE-BROWN). I have cut away all other wires of the CAT 5 so there will be no confusion as to connections to be made. I also stripped the wire ends to allow for clips to be attached. Testing the assembly is now the next step. To do this, I will need to use my multimeter set to the conductivity mode. 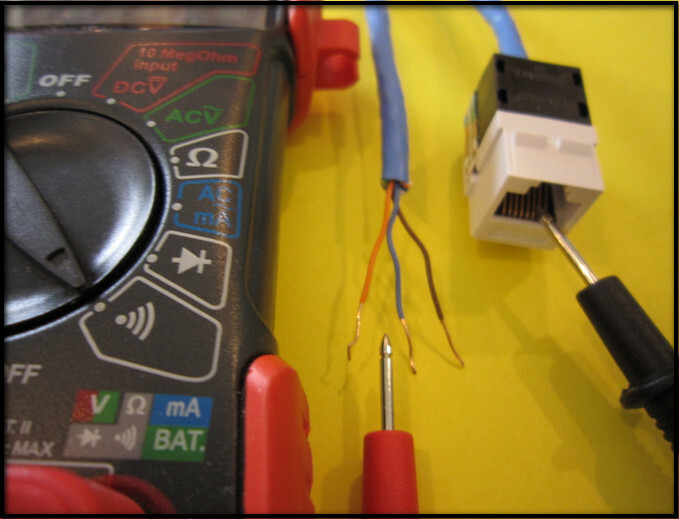 The multimeter probes can be used either way for testing. You will get the same results. 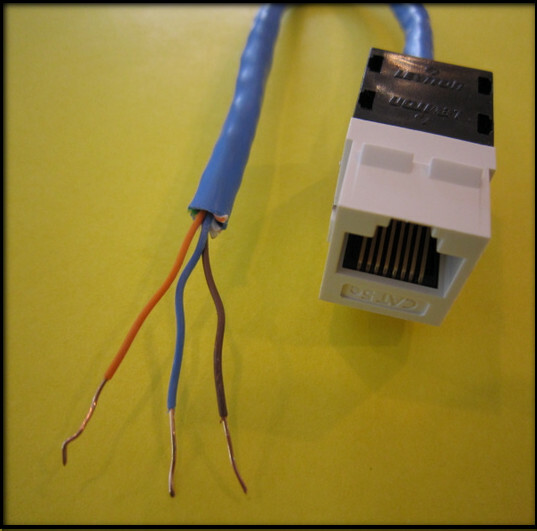 Test each wire with the correct position inside the RJ45 female plug. When you touch the probe ends to the correct points the multimeter will beep. Should this not happen you will need to redo the connections. Keep testing until you get consistent results. 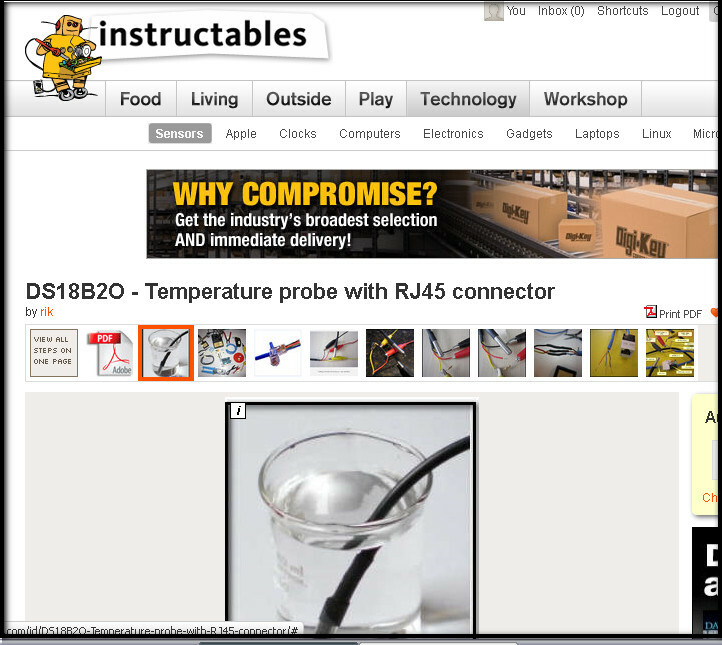 Once you are sure all connections are working move on to test the completed DS18B20 temp probe assembly.